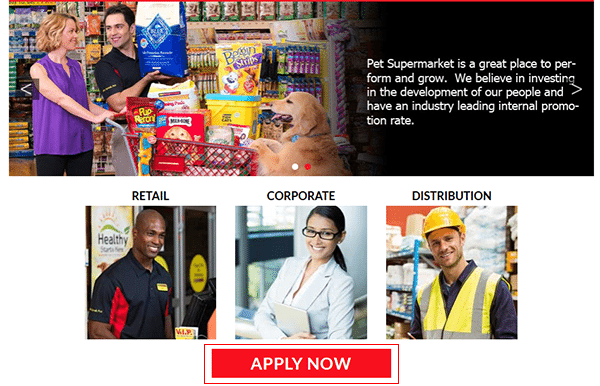 The Pet Supermarket job application can be filled out 100% online on the company’s careers page. Follow the links posted on this page to go directly to the careers page and access the application. Retail, corporate, and distribution positions can all be searched/applied for on the careers website. Follow the steps posted below to learn how to navigate the Pet Supermarket jobs site. About the Company: Pet Supermarket is an American chain of pet supply stores based out of Sunrise, Florida. The company was founded in 1973 and owns/operates numerous locations throughout the United States. Step 1 – Click this link to open the Pet Supermarket employment site in another browser window/tab. Step 2 – Once you’re on the main careers page scroll down and then click the button/link as outlined in the below image. You will be taken to the main application form. Step 3 – In the “Employment Objective” subsection fill in why you want to work for the company. Step 4 – How Did You Hear About Us? – In this subsection select how you heard about the company/job opening from the drop-down list. Step 7 – Select whether or not you have a criminal record. If you have a criminal record you must provide the details regarding your record.